A. Blaine Imel was born in Blackwell and raised in Cushing. 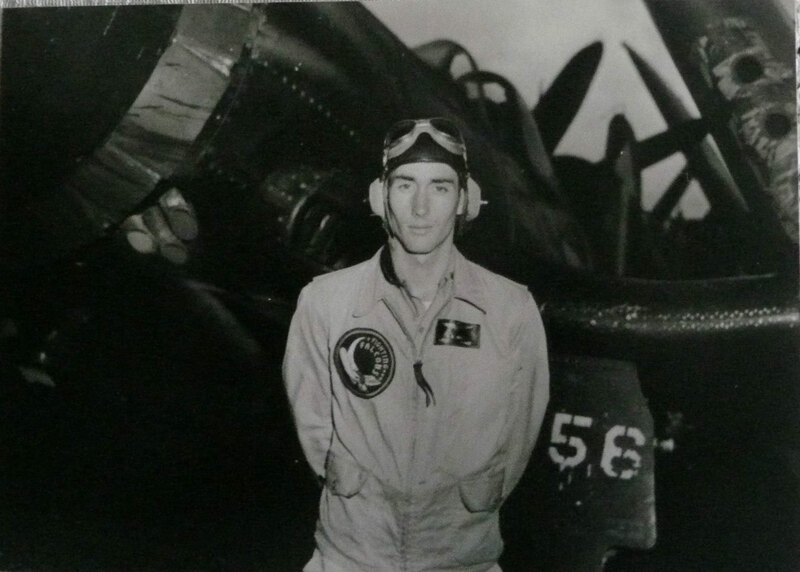 After graduating from high school in 1939, Blaine’s father sensed that the U.S. would be entering the war soon and suggested that he enroll at the Oklahoma Military Academy (now Rogers State University) and learn to fly. Blaine followed his father’s advice and quickly found that he loved flying, a passion that he would foster for the rest of his life. After graduating in 1941, he headed for OU to study architecture but, as his father predicted, America soon joined the war and Blaine left college to enlist in the Marine Corps. He trained in Kansas, Florida, and Texas and even met up and received flight instruction courses with future president, George H.W. Bush, during this time. After he completed his coursework, Blaine was assigned to the USS Bunker Hill, a carrier ship based in the Pacific theater. 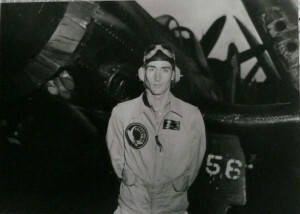 He was part of Admiral Mitscher’s fleet, flying with the squadron that dropped bombs on Tokyo. He also participated in the invasions of Iwo Jima and Okinawa. While the USS Bunker Hill was supporting the invasion of Okinawa on May 11, 1945, two Japanese kamikazes struck the aircraft carrier, causing a severe explosion and fire. Blaine survived by leaping 11 stories from the injured ship into the water while 346 of his fellow sailors and airmen were killed and 43 others were missing and never found. He earned the Purple Heart in the aftermath of the epic battle to take the island. In all, Blaine flew 66 combat missions and shot down three enemy planes, all of which earned him two Distinguished Flying Cross medals and five Air Medals. After the war, Blaine returned to Oklahoma and his studies at OU. He intended to study medicine, but when one of his biology professors saw some of the drawings that Blaine had completed for an assignment, he suggested that he go talk to the Architectural School instead. That one little event changed the direction of Blaine’s entire life. Soon, he met architecture professor, Bruce Goff, and the two became great friends in addition to being student and teacher — later, Blaine would be instrumental in the establishment of the Bruce Goff Professorship of Creative Architecture at OU. During his time at OU, Blaine also represented the university at the International Congress of Architects in Havana in Cuba in 1950 and was awarded 1st mention for his design for a theater. He graduated from OU that same year and began practicing right away. Lucky girl! Blaine Imel died in 2005, but he left behind an outstanding array of architectural wonders in Oklahoma that will delight and inspire future designers for a very long time.